→Can you Use Potting Soil in the Ground? We have previously discussed what a potting ﻿soil(Potting mix) is and how it is different from garden soil. You cannot use an ordinary garden soil for potting plants. However, can you do the reverse? Is it possible to use a potting soil in the ground? This is a very interesting topic which many gardeners are curious about. Can ﻿Y﻿ou ﻿﻿U﻿﻿se ﻿﻿a﻿﻿ ﻿P﻿otting Soil In The Ground? What is a Potting ﻿Soil﻿? 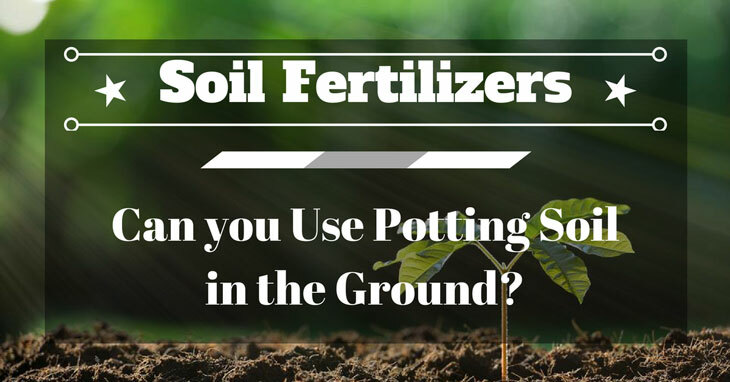 Can You Use a Potting Soil In The Ground? The shortest answer would be yes. Before I will discuss the reason why, it would be good to have a little background about potting soil. What is a Potting Soil? A good potting soil is a combination of different elements that are larger than soil particles. The large size of these elements is necessary to prevent the mixture from compacting. In a pot, there is limited space for air and water movement. If the soil is compact, air and water cannot freely move and this will affect the proper growth of your plant. Commercial potting soils vary in components, some of which are soil-less which combines pine bark, perlite or vermiculite and peat moss among others. The most basic potting soil contains enough nutrients for most plants to last their planting season. It also supports air and water movement. Most potting soil are rich in nitrogen. Nitrogen helps plants produce chlorophyll which gives the leaves their green color and keeps the plants healthy. This element helps plants develop strong root systems. It is also essential for seed production. Plants that absorb more potassium develop strong root systems.Other minerals – Minerals such as sulfur, calcium, magnesium and carbon may also be present in a potting soil. – This type of potting soil is ideal for growing seeds. It is generally lighter and fluffier, allowing tiny seeds to easily put down roots. – This may or may not contain fertilizer particles and is ideal for growing most types of potted plants. – Designed for most types of orchids, this type of mix contains bark. – Another unique mix, this one has the qualities of soils ideal for growing cacti. According to an article What is Garden Soil, the soil in a typical yard contains about 90% mineral residue and 10% decayed organic matter. But garden soil supports earthworms and other insects that aerate the soil. Adding organic matter into your garden soil will make these microorganisms thrive and in turn release their nutrients to the soil. To determine if the soil is healthy or not, you need to identify its structure, texture, pH level, fertility and presence of organic matter. Sandy loam is among the types of garden soil with good texture. It is ideal for plants that require good drainage. Most types of plants also thrive in sandy loam. Potting soil and top soil have very little in common. For one, potting soil has very little to no soil at all. Potting soil has larger particles and are efficient in draining water. Different types of potting soils are widely available in many stores that sell gardening supplies. They are also available online. Alternatively, you can also prepare your own potting soil. Garden soil, on the other hand, are abundant and readily available in your yard. Unlike potting soil which contain specific ingredients, garden soil may or may not contain adequate nutrients and organic matter that are healthy for the plants. It is important to first identify if your garden soil is healthy before deciding on using a potting soil. Not all gardens are lucky enough to have a healthy soil. Some have too much sand or too much clay, which makes it impossible for the plants to grow. This kind of soil is also inhospitable for sowing seeds. Root crops, turnips, parsnips and beets are among the plants that do not like to be transplanted, so they are best planted directly in the soil. If your garden soil is inhospitable, you can easily grow these seeds using a potting soil. 1. Find a suitable location where you can grow your seeds. 2. Dig shallow holes that are twice as wide as the normal holes for growing seeds. 3. In the hole, mix an equal amount of garden soil you just removed plus potting soil. Fill the hole with this mix. 4. In the center of the hole, remove a portion of the soil then fill it with potting soil only. Doing this will create a layer of graded soil for your seeds. It is not recommended to just dig a hole and fill it with potting soil because doing so is like turning your garden soil into a mini pot. Seeds that started growing in potting soil will find it difficult to branch out their roots into a more difficult garden soil. With the grading technique, the seedlings will slowly adjust to their environment. Once your seeds are planted, make sure to properly water your plant and check it from time to time. Can you use potting soil in the ground? Definitely, yes. A potting soil is a good planting medium especially if your garden soil is not ideal for planting. If you choose to buy a potting soil, it is good to check its components as there are potting soils designed for different types of plants. Also, you need to follow the grading technique if you like to integrate potting soil in your garden. That way, seedlings can slowly adjust to their planting environment. How do you find this article? If you find this helpful, please feel free to share it with your friends. If you have a different way of using potting soil in the ground, please share with us your technique through the comment section.